Eduardo is a corporate counsel at Prudential Financial. He provides oversight and advice concerning significant regulatory matters for all lines of business and corporate center functions on state, federal and international issues. 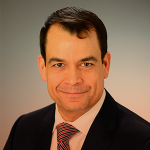 Prior to joining Prudential, Eduardo served as a Senior Counsel with the Securities and Exchange Commission’s Division of Enforcement in New York, where he was a member of the Asset Management Unit. Eduardo began his law career as a commercial litigator at a leading Puerto Rico law firm. In that capacity, he represented local, national, and multi-national corporate clients during all stages of litigation, administrative proceedings, and arbitration matters. Eduardo holds an LLM in International Business and Trade Law from Fordham University School of Law and earned his law degree from the University of Puerto Rico School of Law. He obtained a Bachelor of Science degree from Purdue University’s Krannert School of Management.